Charles Robinson illustratedCinderella in the kitchen (1900), from "Tales of Passed Times" with stories by Charles Perrault. One of the most popular versions of Cinderella was written in French by Charles Perrault in 1697, under the name Cendrillon. The popularity of his tale was due to his additions to the story, including the pumpkin, the fairy-godmother and the introduction of glass slippers. Once upon a time, there was a wealthy widower who married a proud and haughty woman as his second wife. She had two daughters, who were equally vain and selfish. By his first wife, he'd had a beautiful young daughter, a girl of unparalleled goodness and sweet temper. The stepmother and her daughters forced the first daughter into servitude, where she was made to work day and night doing menial chores. After the girl's chores were done for the day, she would retire to the barren and cold room given to her, and would curl up near the fireplace in an effort to stay warm. She would often arise covered in cinders, giving rise to the mocking nickname "Cinderella" by her stepsisters. Cinderella bore the abuse patiently and dared not tell her father, since his 2nd wife controlled him entirely. One day, the Prince invited all the young ladies in the land to a ball, planning to choose a wife from amongst them. The two stepsistersgleefully planned their wardrobes for the ball, and taunted Cinderella by telling her that maids were not invited to the ball. As the sisters departed to the ball, Cinderella cried in despair. Her Fairy Godmother magically appeared and immediately began to transform Cinderella from house servant to the young lady she was by birth, all in the effort to get Cinderella to the ball. She turned apumpkin into a golden carriage, mice into horses, a rat into a coachman, and lizards into footmen. She then turned Cinderella's rags into a beautiful jeweled gown, complete with a delicate pair of glass slippers. The Godmother told her to enjoy the ball, but warned that she had to return before midnight, when the spells would be broken. At the ball, the entire court was entranced by Cinderella, especially the Prince. At this first ball, Cinderella remembers to leave before midnight. Back home, Cinderella graciously thanked her Godmother. She then greeted the stepsisters, who had not recognized her earlier and talked of nothing but the beautiful girl at the ball. Another ball was held the next evening, and Cinderella again attended with her Godmother's help. The Prince had become even more infatuated, and Cinderella in turn became so enchanted by him she lost track of time and left only at the final stroke of midnight, losing one of her glass slippers on the steps of the palace in her haste. The Prince chased her, but outside the palace, the guards saw only a simple country girl leave. The Prince pocketed the slipper and vowed to find and marry the girl to whom it belonged. Meanwhile, Cinderella kept the other slipper, which did not disappear when the spell was broken. The Prince tried the slipper on all the women in the kingdom. When the Prince arrives at Cinderella's villa, the stepsisters tried in vain to win over the prince as they wanted the prince. Cinderella asked if she might try, while the stepsisters taunted her. Naturally, the slipper fit perfectly, and Cinderella produced the other slipper for good measure. The stepsisters both pleaded for forgiveness, and Cinderella agreed to let bygones be bygones. Cinderella married the Prince, and the stepsisters married two lords. 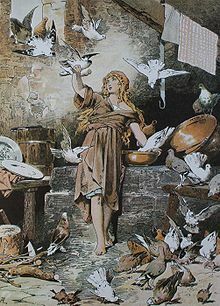 Alexander Zick illustrated Cinderella with the doves, inspired by the Grimms' version. Another well-known version was recorded by the German brothers Jacob and Wilhelm Grimm in the 19th century. The tale is called"Aschenputtel" ("Cinderella" in English translations) and the help comes not from a fairy-godmother but the wishing tree that grows on her mother's grave. A wealthy gentleman's wife lay on her deathbed, and called her only daughter to her bedside. She asked her to remain good and kind, and told her that God would protect her. She then died and was buried. A year went by and the widower married another woman, who had two daughters of her own. They had beautiful faces and fair skin, but their hearts were cruel and wicked. The stepsisters stole the girl's fine clothes and jewels and forced her to wear rags. They banished her into the kitchen to do the worst chores, and gave her the nickname "Aschenputtel" ("Ashfool"). Despite all of this the girl remained good and kind, and would always go to her mother's grave to cry and pray to God that she would see her circumstances improve. One day, the gentleman visited a fair, promising his stepdaughters gifts of luxury. The eldest asked for beautiful dresses, while the younger for pearls and diamonds. His own daughter merely asked for the first twig to knock his hat off on the way. The gentleman went on his way, and acquires presents for his stepdaughters. While passing a forest he got a hazel twig, and gave it to his daughter. She planted the twig over her mother's grave, watered it with her tears and over the years, it grew into a glowing hazel tree. The girl would pray under it three times a day, and a white bird would always come to comfort her. The king decided to give a festival that would last for three days and invited all the beautiful maidens in the land to attend so that the prince could select one of them as his bride. The two sisters were also invited, but when Aschenputtel begged them to allow her to go with them into the celebration, the stepmother refused because she had no dress nor shoes to wear. When the girl insisted, the woman threw a dish of lentils into the ashes for her to pick up, guaranteeing her permission to attend the festival, and when the girl accomplished the task in less than an hour with the help of two white doves sent by her mother from heaven, the stepmother only redoubled the task and threw down even a greater quantity of lentils. When Aschenputtel was able to accomplish it in a greater speed, not wanting to spoil her daughters' chances, the stepmother hastened away with them to the celebration and left the crying stepdaughter behind. The girl retreated to the graveyard to ask for help. The white bird dropped a gold and silver gown and silk shoes. She went to the feast. The prince danced with her, and when sunset came she asked to leave. The prince escorted her home, but she eluded him and jumped inside the pigeon- coop. The merchant goes home and the prince asks him to chop the pigeon coop down. Aschenputtel already escaped. The next day, the girl appeared in a much grander gown. The prince fell in love with her and danced with her for the whole day, and when sunset came, the prince accompanied her home. She climbs a pear tree to escape him, and the tree is chopped down again. But Aschenputtel disappeared. The third day, she appeared dressed in the grandest with slippers of gold. Now the prince was determined to keep her, and had the entire stairway smeared with pitch. Aschenputtel lost track of time, and when she ran away one of her golden slippers got stuck on that pitch. The prince proclaimed that he would marry the maiden whose foot would fit the golden slipper. The next morning, the prince went to Aschenputtel's house and tried the slipper on the eldest stepsister. The sister was advised by her mother to cut off her toes in order to fit the slipper. While riding with the stepsister, the two doves from Heaven told the Prince that blood dripped from her foot. Appalled by her treachery, he went back again and tried the slipper on the other stepsister. She cut off part of her heel in order to get her foot in the slipper, and again the prince was fooled. While riding with her to the king's castle, the doves alerted him again about the blood on her foot. He came back to inquire about another girl. The gentleman told him that they kept a kitchen-maid in the house – omitting to mention that she was his own daughter – and the prince asked him to let her try on the slipper. The girl appeared after washing herself, and when she put on the slipper, the prince recognized her as the stranger with whom he had danced at the ball. In the end, during Aschenputtel's wedding, as she was walking down the aisle with her stepsisters as her bridesmaids, (they had hoped to worm their way into her favour), the doves from Heaven flew down and struck the two stepsisters' eyes, one in the left and the other in the right. When the wedding came to an end, and Aschenputtel and her prince marched out of the church, the doves flew again, striking the remaining eyes of the two evil sisters blind, a punishment they had to endure for the rest of their lives. Villains: In some versions, her father plays an active role in the humiliation of his daughter; in others, he is secondary to his new wife; in some versions, especially the popularDisney film, the father has died.